Hafiza Qaria Rubina, Pakistan’s only woman recipient of Pride of Performance in Qirat, has urged the government to introduce Quran as a subject from the primary level to strengthen the younger generation’s attachment with the holy book and the divine religion. Talking to The Nation on Saturday, she said at present people preferred English as the medium of instructions for their children, because of which Quranic education was not getting as much importance as it should. According to her, even highly educated people, including doctors in various subjects, could not read Quran with correct pronunciation.Reading the divine scripture with right pronunciation is called Tajweed-i-Quran. Qaria Rubina said while education in all spheres of life was important, Quran should get the highest priority in the Islamic Republic of Pakistan. She was awarded Pride of Performance in Qirat in 1996 and was the first woman to receive the honour. Before or after that no woman has been given this award. An assistant professor, Qaria Rubina taught Arabic at the Kinnaird College for more than two decades and has been teaching the subject at the Cooper Road College for about eight years. She took part in many international Qirat contests, some of them held in Malaysia and Saudi Arabia.World known Qari Abdul Basit of Egypt was also all praise for the Qaria for her recitation of holy Quran. According to her, while many parents wanted to teach their children Quran, competent teachers, especially female, who could teach the right pronunciation were not available in adequate numbers. Qaria Rubina said although Qirat competitions were held at various educational institutions, not all participants could recite Quran correctly. Many participants, she said, could recite only certain verses of the holy Quran. But, she made it clear, a competent Qari or Qaria was the one who could recite any verse of the divine book.In response to a question, she said world’s best male Qaris were available in Pakistan but the same could not be said of the females. Qaria Rubina has taught Arabic and Qirat to thousands of students. She runs a seminary in Garhi Shahu where females of all age groups come to learn this art. Even a woman in her 50s has recently come to join a class, she said.At the seminary, students also memorise the holy Quran. Normally, she said, a student memorises the divine book in a couple of years. However, she said, slow learners take a bit longer. Qaria Rubina is the spouse of Mr Khalid Mehmud Hashmi, an assistant professor at MAO College who recites all 30 chapters of holy Quran every day in addition to performing his professional duties. This has been his practice for the past several years. BOB FAW, correspondent: In the heart of mainstream America, a Cub Scout derby where each of the home-designed cars is carefully weighed and measured before roaring off at breakneck speed. Here enterprise, ingenuity, and patience are justly rewarded. ISRAFEEL JAKA: My favorite part was when I got in first. FAW: It’s a mainstream event passionately embraced not only by the Jaka brothers, but also by nine- year-old Bilal Khan, whose education and upbringing is anything but mainstream. 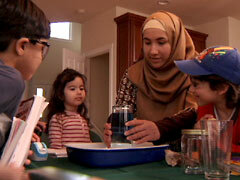 In his Loudoun County, Virginia home, Bilal is being taught math by his mother Zakia. ZAKIA KHAN (speaking to Bilal): So 5 is closer to 7, or 10 is closer to 7? FAW: In another home nearby, Priscilla Martinez is teaching her six children, ages two to 12, about condensation. PRISCILLA MARTINEZ (speaking to children): We’re going to learn about clouds, evaporation, condensation, and precipitation. FAW: They are part of a growing movement—no one knows the exact number—of Muslims who home-school their children because they want them to get a more holistic education than a public school can provide. MARTINEZ: What we are trying to do is give our children a foundation within the family first, and their identities, with values. That’s kind of the springboard for what it is that we would like for them to take with them throughout life. FAW: And home schooling lets these Muslim families focus on their faith. Using the computer, Bilal studies the Quran/ Koran with a teacher from Pakistan, home of his father, Maqsood, and his mother. ZAKIA KHAN: Over there we know that everything is Islamic-based, but over here we don’t see Islamic way of life outside the house. MAQSOOD KHAN: We’re still tied to that country and want them to understand the culture and to learn about the religion. FAW: Priscilla’s twelve- year-old daughter, Hidayah Jaka, a seventh grader, helps her eight-year-old brother, Mikaeel, to read the Koran. HIDAYAH JAKA: It is better like this because we have the flexibility to do it whenever we want. FAW: Muslim parents say home schooling can provide a better learning experience because the work can be tailored to each child’s needs. Bilal, for example, who learned to read before he entered public school, got bored when he had to wait for the other kids in his grade to catch up. MAQSOOD KHAN: It was just not challenging enough for him, and so we felt that we could probably do a lot more to challenge them and to help them learn. They can learn more of what they like, what they feel comfortable with. FAW: In each home the older children assist the younger siblings. When fifteen-year-old Meena Khan is not studying geometry, history, and literature, she helps her fourteen-year-old sister, Heba, with her math. No matter what‘s going on, both families stop what they are doing to pray five times every day. All this, proponents argue, is part of instilling values which their children would not get in public schools. RIZWAN JAKA: We’ve chosen home schooling for our children and our family to provide that, again, the strong values and strong foundation as well as strong academics and strong respect and understanding of our faith as well as respect for other faiths. FAW: Are they getting a good education? Meena excelled in public school before starting home schooling four years ago. She studies totally on her own with the help of a curriculum for home-schoolers. It takes discipline, she says, but she feels she’s doing even better here than she did in public school. MEENA KHAN: I think I’m getting a very good education. I can go at my own pace, so if I understand something I can go ahead, but if I don’t understand something I can slow down on it and review it and go over it again and get help if I need to. FAW: It is a glowing picture. But some educators feel that children are better served in a school setting. At the University of Maryland, where she helps train teachers, Melanie Killen worries that home schoolers can be sheltered and miss the benefits of rubbing shoulders with different kinds of students. MELANIE KILLEN (University of Maryland): Peer relationships are very different from sibling relationships. This is where you learn how to share, negotiate, how you learn how to resolve conflicts. There’s a whole host of very important, fundamental building bricks and blocks for how we become members of a culture that come out of the peer interaction. FAW: Muslim parents who home school understand the criticism and go to great lengths, they say, to expose their children to outside interests. To help integrate their kids into the culture, the Khans and Jakas go to scouting events, to classes at museums and interfaith meetings. Exposed to different faiths, they also bring their faith to others. Here they’re not only part of the mainstream culture, they are totally caught up in it. MIKAEEL JAKA: Today I got my car checked in, and I also got a patch, and I watched a lot of cars go down. It was really cool. 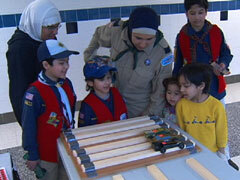 FAW: Activities like this, say Muslim home-schooling parents, show that their kids are not cloistered. RIZWAN JAKA: It’s important to us, again, to make sure that, you know, the children get to know people, and that they’re not sheltered, that they intermingle with people, and they get to know the larger society. PRISCILLA MARTINEZ: We aren’t looking to run away from the world and draw the blinds and shut everything and everyone out living in our own little utopia. What we’re looking to do, especially with our children, is to be out there, to get to know our neighbors. FAW: While each of these families says they have experienced prejudice, they insist prejudice was not a factor in deciding to home school. But prejudice, say educators, can be subtle. MELANIE KILLEN: These are Muslim families living in a predominantly non-Muslim area. You have different conventions, dress, dietary practices, and all that. But there’s also implicit forms of prejudice that people experience and oftentimes don’t even call it that, but they’re uncomfortable. They might feel excluded. There’s this level of uncomfortableness about being in a school that’s not part of their own culture and religion. FAW: Another pitfall: While Priscilla and Zakia are both dedicated and smart, neither was trained as a teacher. MELANIE KILLEN: You need training in terms of how to be a teacher. You’re managing a classroom of children, you’re figuring out how to do this, but you’re also aware of social development and children’s social, cognitive development, their biological development. These are all things that they need to know about. FAW: To make sure home schoolers are making progress, Virginia requires they meet certain requirements by taking a test, by interviewing with a certified teacher or handing in a portfolio of their work. Muslim home schooling is still a small movement, but those who spend hours on the front lines are not crippled by any doubt. MARTINEZ: Our goal is basically to bring up our children who are contributing citizens, who feel that they can and should give back to the world and ultimately to grow up in peace and be able to live a fulfilling life. FAW: As a sign in her living room reads, “Home is where your story begins,” here where the alphabet, arithmetic, and Allah meet.